The Mazda 5 is often called a minivan—but it's a fraction of the size of anything else on the market that bears that classification. In truth, it's really more of a mini-minivan. Though it has had few competitors over the years, the Mazda 5 now counts the three-row Ford Transit Connect wagon as a rival. Ford's hybrid-only C-Max, which is actually based on the same architecture as the 5, can also be included, although it is only sold as a two-row vanlet in the Stats and is somewhat shorter, with hinged rear doors instead of the 5's sliders. The same goes for the Toyota Prius V hybrid. Other economical wagon options include the Volkswagen Golf SportWagen, which is available with gas or diesel engines. The current Mazda 5 is based on the underpinnings of the previous-generation Mazda 3 compact car. It's a van for those who are fond of driving; what it loses in interior space, it makes up for in handling. 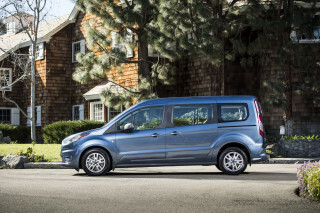 The 2015 model year is likely to be the last for Mazda's slow-selling van. Customers who once sought these practical vehicles are now looking to small crossovers to fulfill their family-toting needs, so dealers will happily steer them toward a CX-3, CX-5 or CX-9 when the Mazda 5 is no longer. 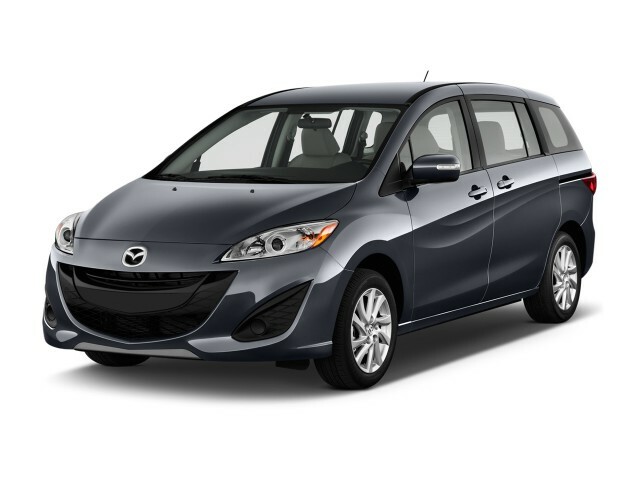 For more information on the Mazda 5, including options, pricing, and specifications, see our full review of the 2015 Mazda 5. Two generations of the Mazda 5 van have been sold in the U.S. The first was offered here from 2006 to 2010. 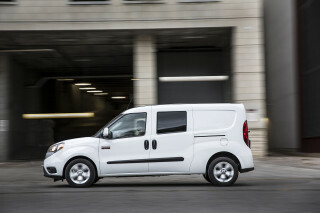 All vans from that generation received a 153-horsepower, 2.3-liter four-cylinder engine. Early models used a four-speed automatic transmission, while the gearbox was upgraded to a five-speed unit from 2008 on. The switch didn't do much for acceleration but did improve fuel economy noticeably. The 2008 update also brought a new design for the center-stack controls and some improvements to the instrument panel, as well as separate climate controls and additional vents for rear passengers. The current Mazda 5 is the result of a redesign for 2012. The latest model's styling is considerably more adventurous, with lines based on Mazda's so-called 'Nagare' design language of swoopy, almost aquatic shapes. The tailgate has a more carlike design than it did in the last generation, and the Mazda 5's front styling may have the most extreme version of Mazda's 'grinning' corporate grille design. With luck, it'll likely be toned down in years to come, to follow the example of the Mazda 3. Because the Mazda 5 is one of the smaller vans on the market, its seating arrangement isn't what you get from a larger minivan. The 5 offers seating for six, split into three rows of two seats. In the first and second row, that means individual bucket seats, while row three gets a bench. The second row can be moved forward and back to accommodate bigger people or more stuff, and also aid entry into the third row. The rearmost rows can also fold to allow for cargo hauling. While its dimensions make it a seven-eighths-scale minivan, from behind the wheel, it maneuvers and handles like a small car. And it doesn't require any more space to park than a compact car either. One downside to the Mazda 5, though, is a noisier interior than you'd encounter in most other vehicles of the type. It feels very carlike—and it can be quite peppy when driven hard, provided you're not carrying a full load. But load up the Mazda 5 and its engine will strain--especially if you opt for the automatic transmission. Mazda offers just one engine, a 157-horsepower, 2.5-liter four, and until the 2015 model year, sporting drivers could order it with a six-speed manual gearbox instead of the five-speed automatic. Excellent steering with superb road feel, tight control of body motions, and a light driving feel makes the Mazda 5 sheer fun to drive--and when's the last time that could be said of any minivan at all? Although you can row the automatic manually through the gears, the standard manual gearbox on the Mazda 5 made it more fun to drive. While the Mazda 5 doesn't accelerate quickly, handling is a strong point; even loaded up, it can take on a curvy road with a surprisingly nimble and stable feel. Likely due to low take rates, Mazda chose to kill the manual option for the 2015 model year, while also making some minor changes to package content on the remaining models. Trims and upholsteries have been upgraded over the previous generation, though we still find them to feel cut-rate up close. Some shoppers will also resent the lack of Bluetooth connectivity on certain trim levels, and the lack of a navigation option altogether. For 2013, Mazda did add a USB input as well as side mirrors with integrated LED turn-signal indicators. Changes have been minimal since then, but in summer 2014 the Insurance Institute for Highway Safety (IIHS) tested a 2014 model and found that it didn't fare well in several categories. In particular, it failed the tough new small overlap frontal test. I received a Mazda 5 as my rental after my car accident. I have to say i am absolutely in love and don't want to return it lol. Being that i can fold down all the backseat for more room is great. However... I received a Mazda 5 as my rental after my car accident. I have to say i am absolutely in love and don't want to return it lol. Being that i can fold down all the backseat for more room is great. However, there isn't enough "trunk" space for my stroller and groceries. With a forward facing infant carseat and a booster seat the car seats themselves need to be pushed further back which means there is no foot and leg room for the back 2 seats. With only having 15month child in the vehicle or 2 its not a big deal (i only have 1 child) but when my eldest niece is in the backseat who is not in a carseat she has no leg room. Last 3 years, I ve spent 1000s of pounds on it. First of all, DPF is big broblem... And it has to be serviced at Mazda dealers otherwise engine light comes on.. If you need a part, it has to be imported from... Last 3 years, I ve spent 1000s of pounds on it. First of all, DPF is big broblem... And it has to be serviced at Mazda dealers otherwise engine light comes on.. If you need a part, it has to be imported from abroad and very expensive... Most mechanics can't fix it so you have to take it to Mazda dealer and that's very costy and It takes 10 to 15 days to be fixed minimum.. All and all I wouldn't recommend this car to anyone.. Buy Mercedes, Audi or skoda.. Much better cars and cheaper to run..